Dave Grohl’s energy, Mr. Rogers’ mentality, Ray Charles swagger. Matt Walberg believes musicians are athletes. He knows he is here to change the world through his music, movement and emotion. He knows his path isn’t necessarily yours, he wants to help you find your own way to your personal greatness. Matt Walberg knows that you matter. If a rock show and a TedTalk® had a love-child, the result would be the motivating Nashville rock troupe Matt Walberg & The Living Situation. 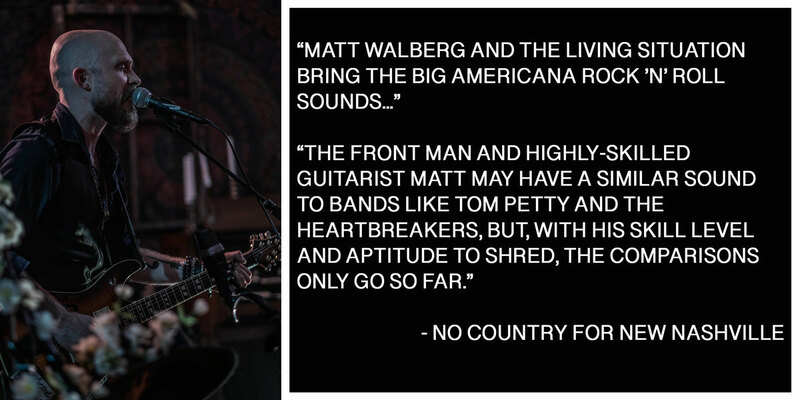 With a current lineup of long-time friends and Nashville musicians, Matt Walberg & The Living Situation brings a positively charged music and entertainment experience to the stage. The band is fronted by guitar-slinging Matt Walberg who has made an impact in the DIY music community of Nashville, TN, and audiences of their live performance receive an experience that is as inspiring as it is face-melting. Guitar-fueled rock anthems and introspective songwriting makes listeners feel like they are a part of The Living Situation themselves.